Lionel Messi reportedly wants Barcelona to land Mohamed Salah, and Ousmane Dembele could head in the opposite direction to Liverpool. Given the Catalan giants already have Messi himself, Dembele, Malcom and Philippe Coutinho to play behind Luis Suarez, it doesn’t appear as though they particularly need to bolster their attack. Particularly given that they’ve conceded 18 goals in 12 La Liga games so far this season, they’d surely be well advised to focus on sorting out their defence instead. However, according to Don Balon, it’s been claimed that Messi wants to see them bring in a marquee attacking signing in the form of Salah, while it’s added that Dembele could be included in the deal along with money to make it happen. It comes after The Sun reported this week that the Reds are keen on the £85m Frenchman, and so perhaps he could be a crucial piece to add to the puzzle. As noted by The Express, question marks have been raised over Dembele’s professionalism this season which may well back the report above suggesting that he could be used as part of a swap deal. 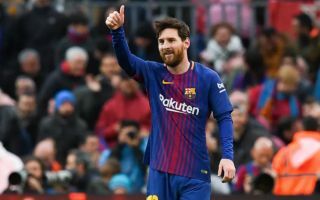 Despite scoring six goals and providing two assists in 15 appearances in all competitions so far this season which is an improvement on last year, it appears as though off-the-pitch issues could now hinder his future at the Nou Camp. Nevertheless, while the touted swap deal does start to make sense on some level, it’s still difficult to see any deal convincing Liverpool to willingly part company with Salah. The 26-year-old has overcome a slow start to the campaign to now bag eight goals and four assists in 17 outings, following on from his stunning season last year in which he scored 44 goals and provided 16 assists. With that level of influence and impact in mind, it will surely take a sensational offer or Salah himself pushing for the move to convince Liverpool to green light a deal.